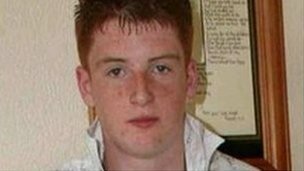 A man has pleaded guilty to the sectarian murder of a Catholic teenager in Ballymena seven years ago. Michael McIlveen, who was known as Mickey Bo, died after being beaten and kicked in an alleyway. Jeff Colin Lewis, 24, from Rossdale in Ballymena was convicted of the murder in 2009. The conviction was later quashed and a retrial ordered. On Friday, he admitted his guilt and will be re-sentenced. Two other men are already serving life. Christopher Francis Kerr, 26, from Carnduff Drive, will have to serve at least nine years before he can be considered for parole. Aaron Cavana Wallace, 24, from Moat Road, will serve eight years. Both men pleaded guilty. 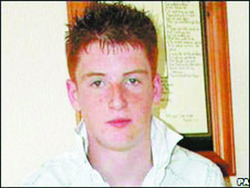 Fifteen-year-old Michael McIlveen died from brain injuries the day after he and two friends were attacked in 2006.